Il fiore di luppolo (the hops flower) is a specialised (craft) beer shop in Lugano. In addition to offering a wide selection of national and international, high-quality beers, they organise private and public beer tastings and have the objective to advocate beer culture in Lugano and Ticino. 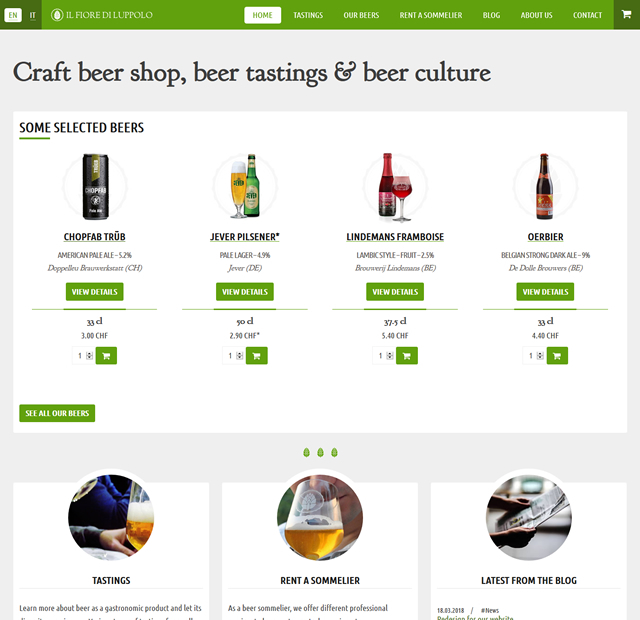 This fully responsive, multi-lingual website provides information about the beer shop and its services, which include several predefined beer tasting themes and professional consultancy for local bars and restaurants. Furthermore, the website lists all currently available beers and offers the possibility to order bottles online. Il fiore di luppolo is a product by Nico De Backer Sagl.